Musicians on Call (MOC), an organization with a mission to bring live and recorded music to the bedsides of patients in healthcare facilities to enhance the healing process, has enlisted musicians and other volunteers to play for over 136,000 people. MOC continues their mission through room-to-room hospital performances by both local musicians and national celebrities. Since opening the doors of the first National Chapter in April 2007, the organization has received the support of many country artists. Through these volunteer performances, MOC has visited the bedsides of over 10,000 patients, families and caregivers in Nashville. This year, MOC will once again benefit from the 3rd Annual Country Weekly Fashion Show and Concert, being held June 10 at Nashville’s Wildhorse Saloon.Artists who have graciously given their time and talents to visit patients at local Nashville hospitals include Fashion Show participants Chuck Wicks, Chris Young, Mark Wills, Trent Willmon, Joey & Rory and Jypsi. “I think I may have had more fun than the patients, but it was a joy to walk into those rooms and see the smiles on their faces,” said volunteer performer and RCA artist Chris Young. 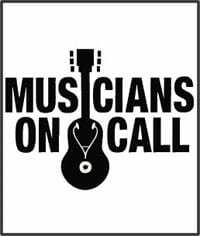 “I am looking forward to doing it again very soon.” You can find more information about Musicians on Call here.